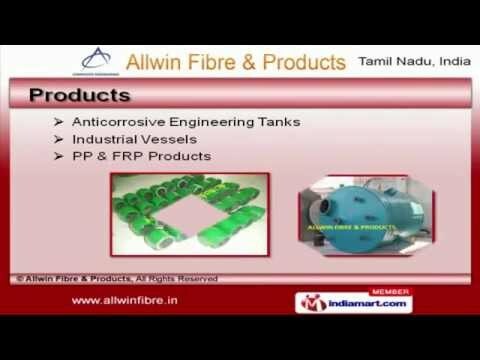 Welcome to Allwin Fibre and Products, Manufacturer and Supplier of FRP Products. The company was established in 2003 at Chennai. Our products are applicable in Site Cabins, Bathrooms, Bus Stations and other areas. Ashok Leyland, Vel and Birla Group are some of our esteemed clients and we are backed by Prompt delivery schedules and convenient payment modes. We offer a vast range of Industrial Vessels, Anticorrosive Engineering Tanks and FRP Products. Our FRP Towers, Blowers and Lining Systems are best in the industry amongst others. We are instrumental in offering a wide array of Grating Textures, FRP Pipes and PVC Corrugated Roofing Sheets that are cost effective. We also provide Scrubber Systems, Aeration Floats and Fume Exhaust Ducts that are a class apart. We are known in the industry as the manufacturer of Vacuum Degassers, Hoods and Covers. Our clients can avail from us an exquisite range of Fume Stacks and Industrial Ducts that are highly efficient.